They’re not, actually. * For most days when no one is paying attention they’re usually right. The thing is, we only pay attention when the stakes are high (“BIG STORM COMING! !” or when we’re planning for a vacation) and then when the forecast is wrong we remember that, hang on to it, and share stories about that day we prepped for the storm, canceled a meeting, stayed home from work…and the storm didn’t come. Sure, sensationalist weathermen competing for viewer eyeballs play into this, so it’s fun to have them be the scapegoats. But that’s not the point. The point is that people may talk louder about your failures than they do about your successes; or, worse, the naysayers speak up first and loudest, just when you’re getting going. That’s the risk in showing up every day and putting yourself out there. Don’t let the fact that the critics talk – sometimes loudly – become an excuse for you not to show up in the first place. 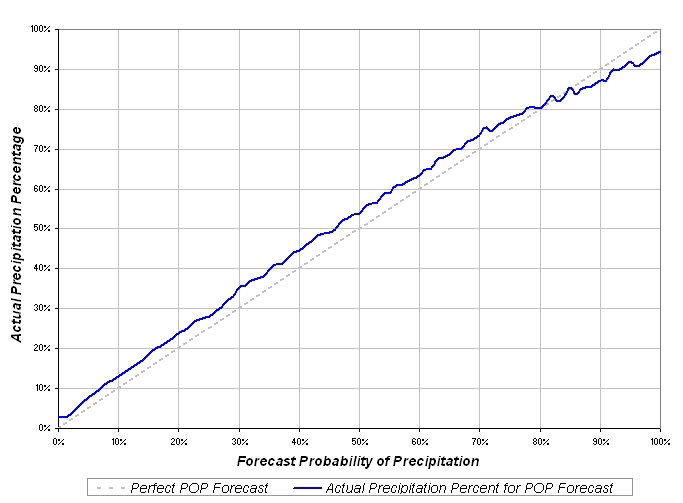 *NOTE: here’s the chart (original analysis here) on the accuracy of weather forecasts. If forecasts were 100% accurate, the solid blue line would lie directly on top of the dashed line. Pretty accurate, actually.